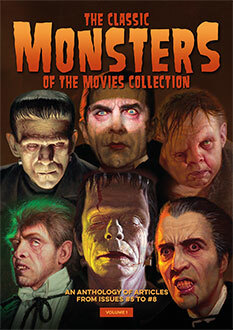 Protect your Classic Monsters of the Movies magazines with our elegant binders. There’s no better way to keep your copies of Classic Monsters of the Movies in pristine condition than with our binders – they’re the ideal way to preserve your magazines for posterity. This version comes with green text for your copies of Classic Monsters of the Movies, and comfortably holds eight copies (nine at a squeeze). The magazines are held in place via sturdy flexible coated metal rods, which fit snugly to ensure secure storage and yet easy browsing, without damaging the pages of your magazines. Already a collector? You can purchase both this binder and the silver-text Ultimate Guide binder together and save on shipping, with our Binder Bundle – click here for details. 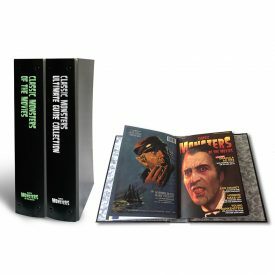 These stylish Binders for your Classic Monsters Magazine, and Ultimate Guides, are nicely designed, and will look great on the shelf, of your prized collection of Classic Monsters. I like the Siver embossed logo on the Spine of the Binder, and the other has a Green Colour for the Classic Monster Magazine. These will keep your Magazines in great condition, and easy access, whenever you need it. Recommended. It’s nice to have a sharp-looking binder to hold multiple issues of CMOTM, but the Classic Monsters of the Movies binder will— realistically (and safely, without damaging the mags)—only hold 9 issues (three per the three upper and lower slots in the binders)not 12. The Ultimate Guide binder holds 12 guides though.